My fan art entry for Udon Comics' Street Fighter Summer Sports Special contest. 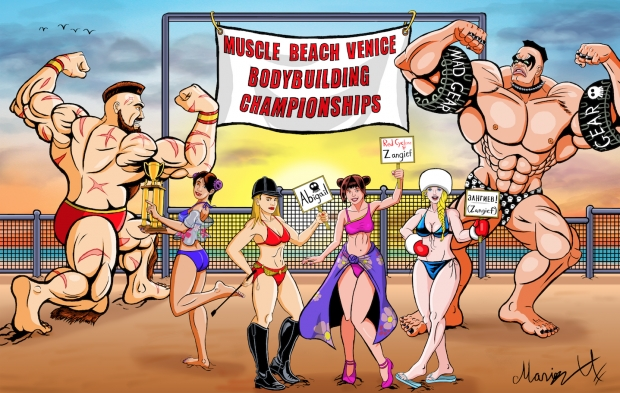 For this year I drew the Judgement girls from Street Fighter III (who show up in the game if the match goes to a draw), judging a bodybuilding contest between Zangief and Abigail. I made Zangief win since he has Muscle Spirit! I drew the Judgment girls based on their appearance in Street Fighter V's Kanzuki Beach stage. Julia is the one in red, Anna has the Russian hat & winter gloves, and Rifa & Toli are the two chinese sisters with the Ox horn hairstyle similar to Chun Li's. Anna's sign says Zangief in Russia FYI. Enough cheesecake and beefcake for everyone!